“Look dad, I’m like a jungle gym!” said this lucky boy. 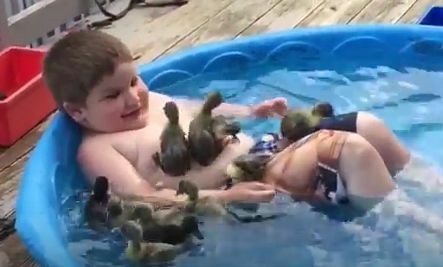 This definitely looks like the most fun anyone has ever had in a kiddie swimming pool—that goes especially for the ducklings! Awwww and that is how you raise a kid! Cute is a weak word for this video ! ! ! Animals always included, of course ! One of the fun things about having ducks is that they DO love hanging out with kids and their caretakers. Very cute!